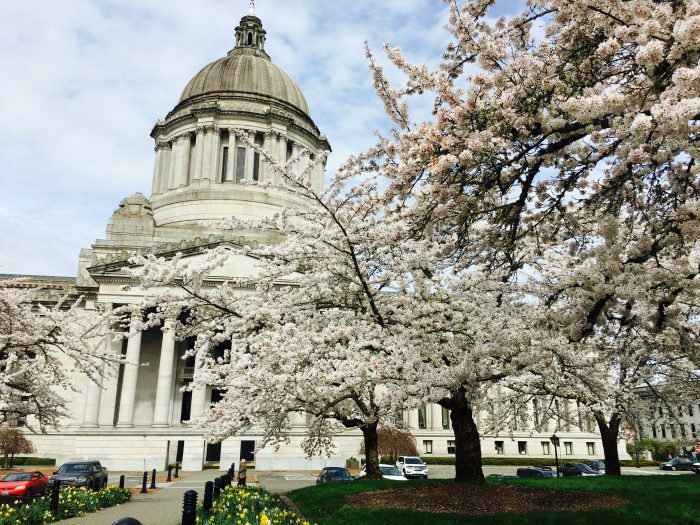 Week 5 and 6 brought committee action, floor action and budget deadlines for Washington Bikes’ legislative agenda. Bill sponsor, Senator Rolfes speaks in support of SB 6434 concerning electric-assisted bicycles. We’ve now passed the halfway point of the 60-day legislative session. With only three weeks of session left, there is still much work to be done. Timelines and movement of bills continue at a rapid pace. Read on for a quick update on where things stand in Olympia for people who bike. SB 6434 (Rolfes) and HB 2782 (Kilduff) were exec’d out of the Transportation committees. SB 6434 moved forward with an agreement that work would be done to address the issue of a trail or greenway that runs through multiple jurisdictions having the potential for unique e-bike code in each of those jurisdictions along the trail. SB 6434 was voted on the full Senate floor on February 9. Senator King offered a floor amendment that requires local jurisdictions that share a trail be in agreement on a code change should they update their e-bike code from the state framework. This will prevent a mismatching of e-bike code along a single trail. Senators Rolfes and Nelson spoke enthusiastically in favor of the e-bike bill on the Senate floor. Final passage was 44-2 and the bill is now on to the House! HB 2900 (Kilduff) was exec’d out of the House Transportation committee with the direction to keep working some of the concerns that had been raised my members during executive session. There are two proposed floor amendments that will makes some changes to the underlying bill, but work to address concerns the concerns that’d been raised. Read below for a description of the changes. The mandatory doubling of infractions will be deleted, meaning discretion will be restored. The Vulnerable User Education Fund will direct funding to educate and raise awareness of the public (and motorists) regarding interaction with vulnerable roadway users and with any remaining funds direct funding to educate law enforcement and justice professionals. A report back to the legislature will be required for analysis of citations given of the vulnerable user law (criminal and civil) and updating on the education/awareness programs being carried out. HB 2900 has been pulled out of Rules and is ready to run on the full House floor, it’s now a waiting game. Washington Bikes and Washington Trails Association in partnership have submitted a budget request for $125,000 to conduct the study of the economic and health benefits of hiking and biking for Washington state (Operating budget). The legislative sponsors of the requests are Senator Van De Wege and Representatives Barkis and Chapman. Budget requests were due last week. The supplemental budgets are expected to be released next week. Wednesday, February 14 is House of Origin cutoff, bills will need to be passed out of their house of origin if they are to stay alive this session (unless they are considered Necessary to Implement the Budget). Committee hearing schedule will begin again on Thursday. SSB 6434 (e-bike bill) has been scheduled for a hearing in House Transportation Thursday, 2/15. Washington Bikes will continue to work on behalf of bicycling in Olympia over these next few weeks. Things are moving fast, but check back here for updates on our legislative progress! Week 4 saw several advances for the 2018 Washington Bikes Agenda. After three weeks of laying groundwork, meetings and productive conversations to advance some of Washington Bikes 2018 priorities, week 4 of the 2018 legislative session brought a host of committee hearings on legislation – mostly good and a little bad – for people who bike. 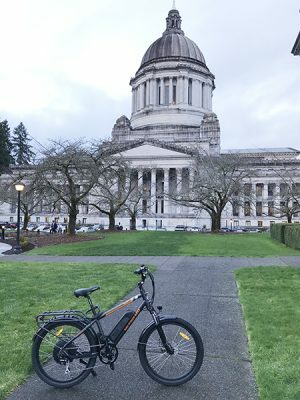 Washington Bikes’ priority legislation – to update electric-assist bicycle (e-bike) laws – were heard in Senate and House Transportation committees Wednesday, January 31. The e-bike industry has taken off in recent years, with e-bike sales up more than 450% since 2013, according to The NPD Group. As the e-bike industry has been fast to innovate and grow, current state law pertaining to e-bikes is outdated. SB 6434/HB 2782 will update Washington state e-bike laws to national standards and provide certainty for manufacturers, retailers and consumers. Arkansas, California, Colorado and others have already implemented this legislative update. This legislation clarifies the definition of electric-assist bicycles (e-bikes) and updates regulations to treat specific e-bikes more like traditional bicycles, allowing more types of users to enjoy the health benefits and accessibility that come with bicycling. Additionally, in partnership with Raleigh Electric and Old Town Bicycle of Olympia, Washington Bikes hosted an e-bike demonstration in front of the capitol. Legislators, staff and lobbyists all got a chance to check out and ride around on an assortment of e-bikes. 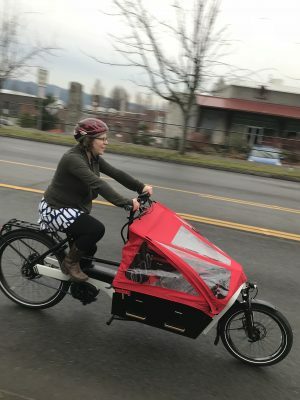 House and Senate bills were heard in their respective transportation committees with compelling testimony from job creators like Rad Power Bikes, a mother who transports who two young children on her e-bike, as well as trail users. Both bills are scheduled for executive session prior to the February 7 fiscal committee cutoff. A late addition to Washington Bikes’ 2018 legislative agenda is legislation that strengthens the 2011 Vulnerable User Law. This vulnerable user bill (HB 2900) is exciting and important because since its passage in 2011, funding for the education of prosecutors and law enforcement of the vulnerable user law has been limited and oftentimes non-existent. This new legislation seeks to change that so that families and individuals who suffer from traffic violence can seek justice. HB 2900, sponsored by Representative Kilduff, would strengthen the penalties given for specific traffic infractions involving a vulnerable user. The fines collected would be deposited into a vulnerable user education account that would go towards educating law enforcement, prosecutors and judges to educate them about how to enforce Washington’s vulnerable user laws. HB 2653 funds electric vehicle sales tax incentives. Washington Bikes position on the legislation is not about the content of the legislation, but instead based on the funding mechanism that takes money from the state’s multimodal transportation account, and spends it on vehicles that do not fit the larger definition of what multimodal transportation is. Washington Bikes holds that this limited funding source should remain dedicated to funding modes other than cars. 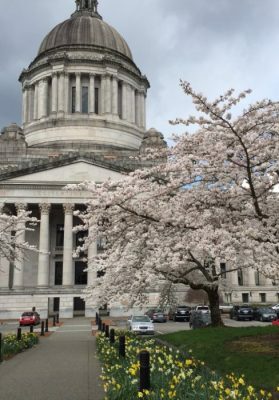 WA Bikes testified opposed to HB 2653 along with a coalition of multimodal partners, including the Safe Routes to School National Partnership, Feet First, Futurewise, the Washington State Transit Association and Transportation Choices Coalition. Already, demand outstrips the supply for limited Multimodal Transportation Account funds that support Safe Routes to School projects (sidewalks to schools and trails) and programs, as well as bicycle/pedestrian safety projects. Additionally, projects that grow transit, including Regional Mobility Grants, in the state also receive valuable funding from the Multimodal Transportation Account. If there is money to be spent in the multimodal account, it should be spent buying down more of these active transportation grant program lists. HB 2653 moved out of the Transportation committee last week and has been referred to the Finance Committee. Check back for updates from the 2018 legislative session! Tomorrow, January 31, Senate and House Transportation committees will hear SB 6434 (Rolfes) and HB 2782 (Kilduff), these companion bills will update Washington’s electric-assist bicycles laws. Newly introduced legislation clarifies the definition of electric-assist bicycles (e-bikes) and updates regulations to treat specific e-bikes more like traditional bicycles, allowing more types of users to enjoy the health benefits and accessibility that come with bicycling. Class 1 and 2 e-bikes permitted on shared-use paths and bike lanes subject to local control. Class 3 e-bikes use on streets and paths within or adjacent to a highway subject to local and agency control. Require labeling of classification number and top-assisted speed on all e-bikes sold after July 2018. Do you have an e-biking story to share? We’re collecting stories like yours to demonstrate how e-bikes help more people – and more types of people – integrate biking into their lives. 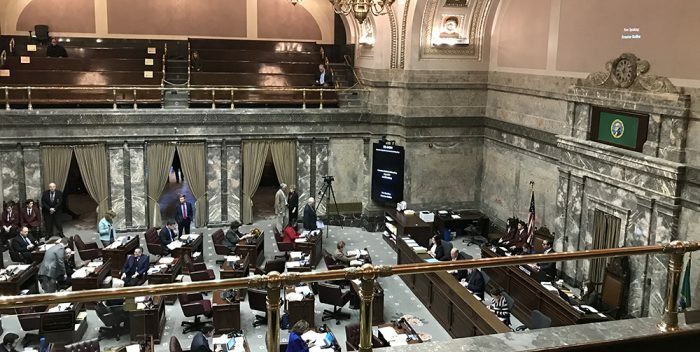 Last night the Washington state legislature passed the long awaited $4 billion budget funding capital projects throughout the state. Next step, on to the governor’s desk! The Senate and House agreed upon a bipartisan compromise budget in 2017, in an unprecedented outcome the legislature adjourned without passing the $4 billion capital budget. The final votes were held up due to conflict over another legislative matter regarding the Hirst decision and water rights. Washington Bikes is thrilled that the 2017-19 capital budget investments will come to fruition. $500,000 investment in the Wilburton Trestle, a key connection on the Eastside Rail Corridor. Passage of the capital budget brings the total investment in this project for the 2017-19 biennium to $3 million! $2.5 million was previously secured in the transportation budget passed in 2017. $80 million investment in the Washington Wildlife and Recreation grant program (WWRP). 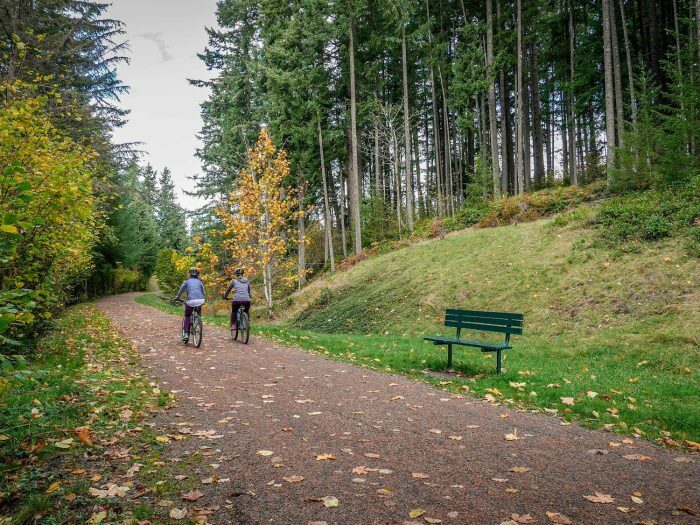 Projects on the WWRP funding list include Washington Bikes’ priorities: trail development, enhancing state parks, and improving outdoor recreation opportunities. This budget means an additional $13 million for Washington’s trails! The passing of the 2017-19 capital budget means more people biking and walking on trails and connections that are safe, accessible and connected throughout Washington state! Check back soon for updates from the 2018 legislative session. Stay in touch by signing up for Washington Bikes’ alerts! The 2018 legislative agenda works to improve bicycling statewide. In 2017 Washington Bikes worked to pass bills to form the Cooper Jones Bicyclist Safety Advisory Council safety legislation, curb distracted driving, and also advocated for valuable investments to build the Wilburton Trestle and protect valuable multimodal transportation dollars. Those solid achievements didn’t come easy as the legislature went through not one, but three special overtime sessions. All the way through the third special session, Washington Bikes staff, lobbyists, and supporters continued to monitor and work to represent people who bicycle or want to bicycle in Olympia for a record-setting 193 days. The Washington Bikes 2018 legislative agenda builds on 2017’s momentum in the short session of the two-year biennium. Washington Bikes Board of Directors and staff set a 2018 legislative agenda to address the changing nature of bicycling (especially as electric bicycle use grows statewide), protect critical multimodal investments, better understand the economic and health benefits of bicycling, and continue to expand bicycle networks statewide and to protect trails. 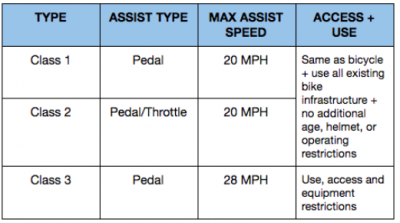 Updating Washington’s electric-assist bicycle laws to national standards. The usage of electric-assist bicycles (e-bikes) is booming. They serve as a way to “flatten hills” across our hilly and mountainous state, and allow many who feel intimidated by biking a new opportunity to experience the freedom of two (or three) wheels. Rapid innovation in the e-bike industry has led to greater adoption and more e-bikes on streets and trails. Existing Washington state laws pertaining to e-bikes are outdated and fail to address all types of e-bikes currently on the market, as well as where they can go. 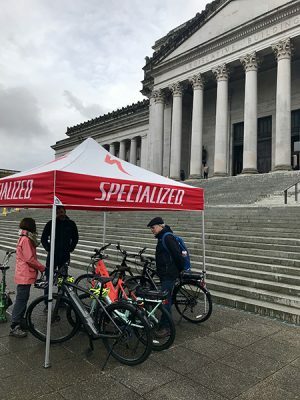 The proposed legislation updates the classification system to give Washington state new tools to effectively enforce and manage e-bikes. Ask: Legislation to update electric-assist bicycle regulation, which will create a framework consistent with national standards. It will provide clear expectations for manufacturers, retailers and consumers in Washington state. Protect the multimodal account so all Washingtonians can get around. Washington state is committed to investing in multimodal transportation options solutions beyond single-occupancy vehicles. The multimodal transportation account dedicates transportation funds for rail, ferries, transit, biking and walking, which are multimodal in nature. These investments include: the bicycle and pedestrian grant program, regional mobility grants and Safe Routes to School programs and projects. Defend: limited multimodal dollars must remain dedicated to the purpose of providing transportation choices and solutions and not diverted to solutions for electric single occupancy vehicles. Measuring the economic impact & health cost savings of biking and hiking in Washington. Bicycle travel and tourism is big business and benefits Washington businesses with $3.1 billion in annual spending. Physical activity is another big benefit of bicycling and its particularly important as the nation addresses its obesity crisis and as our state’s children struggle with getting the recommended amount of daily physical activity. In a partnership with the Washington Trails Association, Washington Bikes will be seeking funding for a study to be conducted by the Washington State Department of Commerce. The study will quantify the bicycle and hiking tourism industry and the health benefits from these forms of active recreation and transportation. This deeper dive, building on the Governor’s 2015 Taskforce on Outdoor Recreation and Parks (which was co-chaired by then-Washington Bikes Executive Director, Barb Chamberlain), will provide new strategies for health cost savings and grow our state’s economy, particularly in rural areas. Protecting and connecting trails statewide. Trails form a backbone of many of the biking and walking networks statewide. Key project priorities include the development of the cross-state John Wayne Pioneer Trail, as well as the regional backbone for the East King County trail network, the Eastside Rail Corridor. This November voters made smart choices to elect candidates who support healthier and safer communities through better bicycling with approximately 80% of Washington Bikes’ endorsed candidates winning. Your continued support, investments in Washington Bike PAC and votes on Election Day made these wins possible. Thank you for making your voice heard! In Bellevue with the re-election of Lynne Robinson and the election of Janice Zahn and Jared Nieuwenhuis the city is poised to build the Bellevue Bike Network by 2020. 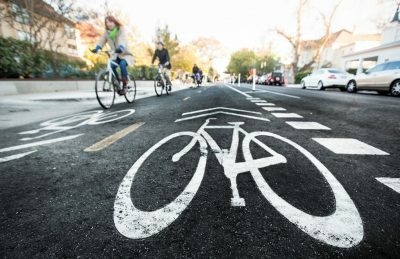 In Spokane the re-election of Candace Mumm and Breean Beggs along with the election of Kate Burke brings the leadership in place to implement and prioritize projects with new bike lanes, new safe attractive spaces for walking and improved connectivity. In Seattle the re-election of Lorena Gonzalez and Pete Holmes along with the election of Teresa Mosqueda and Jenny Durkan position the City of Seattle to build a basic bike network downtown by 2019 and complete the Burke Gilman Trail’s Missing Link. The real work starts now. Washington Bikes is excited to collaborate with newly elected and re-elected public leaders to build connected and safe bike networks that get people where they need to go. Finally, it takes the generous support of people like you for Washington Bikes to serve as the statewide voice for better bicycling. Please make a gift today to see this work continue. Donate here. 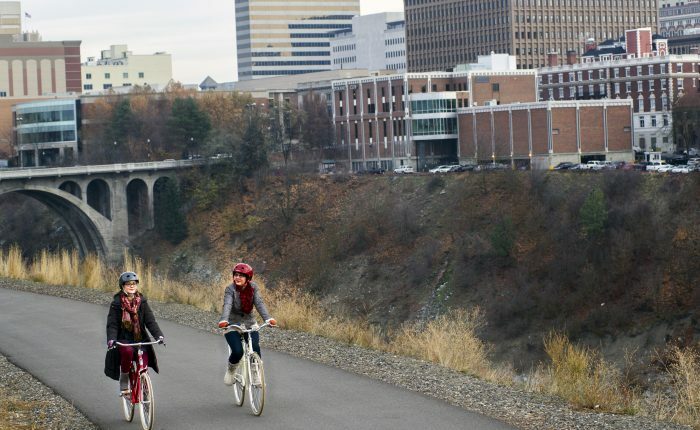 Spokane is a livable, thriving community that is building new streets and trails that will connect the city and provide increased access to active transportation choices. Let’s keep the momentum going by re-electing Spokane city council’s current bike-friendly leaders and electing strong voices to the council. Implement its six-year comprehensive street program and prioritize projects with new bike lanes, new safe attractive spaces for walking and improved connectivity throughout Spokane. Take advantage of the new connections that will happen when the University District Gateway Bridge is completed. This new connection represents much more than a bridge; it’s a conduit between the University District and the East Sprague Avenue area. The bridge will not only be a safer bicycle and pedestrian route to and from campuses, but is already spurring development and revitalization of the communities on either side. Building on that momentum will require smart choices by the next Spokane city council. Become the next Washington city to have a bike share program. The city of Spokane has convened a workgroup to address bike share planning and the hope is that a program will be on the ground by 2019. Bike share systems have enormous potential to increase access to bicycles and fill gaps in the transportation network. Leverage the growing momentum for all ages and abilities infrastructure and programming, like through Safe Routes to School and the Walk Bike Bus program. There is demand and momentum for a bikeable and walkable Spokane, but in order to ensure the City continues to reach it’s potential as a healthy, vibrant community, it’s critical to elect champions who share our vision and priorities for Spokane. Washington Bikes has endorsed candidates who have committed to ensure Spokane is investing in safe, connected places to bike and walk. If elected, Washington Bikes will work with its partners to hold the candidates accountable to create a more bike-friendly Spokane. Ballots drop this week! Be sure to vote for your local bike champions and to mail in or drop off your ballot by November 7. With less than four weeks until Election Day, doorbelling and phone calling on behalf of Washington Bikes’ endorsed candidates will take place between now and November 7. Sign up below to get plugged in to ways to support your nearest bike champion! Whoever fills the three council seats will help chart the trajectory of a rapidly changing Bellevue. We need people in leadership who’ll build a Bellevue Bike Network by 2020. Sign up today to help elect these bike champions. Three of Bellevue’s seven council seats will be decided this election. 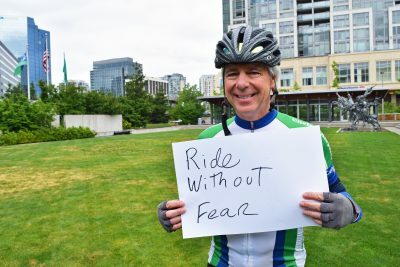 Since Bellevue is a “strong council” city, with no elected Mayor, electing council members who’ll take action to advance safe biking is critical: they collectively hold the key to change. Over the next four years, the task of city council will be to make sure safe places to bike materialize from funding sources and planning that’s already in place. Most pressing is the reality that much of Bellevue’s street network – especially downtown – is devoid of safe places to bike. Six lane roads with no bike lanes present a future opportunity for bikes, but today are unappealing to even the most experienced, fearless riders. Until recently, Bellevue’s sole transportation focus was moving cars as efficiently as possible. But thanks to newer voices on the council the tide has started to turn in Bellevue. The city’s 2016 Transportation Neighborhood Safety tax levy was approved by local voters and came with a promise to start building a connected, all ages and abilities, bike network. Turning that funding into concrete protected bike lanes downtown is the next logical step, and bike-friendly voices on council are essential to making that happen in the next couple of years. Today, wide, multi-lane streets devoid of bike lanes leave little option in downtown Bellevue but to take to the sidewalk or ditch the bike altogether for all but the most fearless of riders. The next city council has the chance to make biking safe and inviting in downtown Bellevue. Between the Eastside Rail Corridor and SR-520 trail, more people will soon be arriving to Bellevue’s downtown streets on bikes, and that number is only going to increase as more of the Eastside Rail Corridor is built in the next few years. A network of protected bike lanes in downtown Bellevue will get people safely and comfortably from the SR-520, ERC, and I-90 trails to the places they need and want to go. We’ve endorsed candidates in all three Bellevue city council races who say they’ll work to ensure that there’s more funding for biking in the next city budget, and that they support building a Downtown Basic Bike Network in Bellevue by 2020. If elected, we’ll be holding these candidates accountable and working with them to create a more bike-friendly Bellevue. It’s not just Bellevue where electing bike-friendly leaders now is essential. In each one of the Eastside communities we’ve endorsed, there are important funding and policy decisions coming up that can make for safer, connected communities by bike. With less than eight weeks until Election Day, we are in the final stretch! Doorbelling and phone calling on behalf of Washington Bikes’ endorsed candidates will take place between now and November 7. Sign up below to get plugged in to ways to support your nearest bike champion! A new council and a new chance for Sammamish and King County to come together and complete this regional trail, community space, and local treasure. Sign up today to help elect these bike champions. This November’s election will decide who fills four of the seven seats on the Sammamish City Council. None of the current council members whose terms are up are running for re-election. Instead, a slate of fresh faces is vying for the four open council seats. The fate of the election will shape the makeup of the majority of the Council, and thus the flavor of the council’s direction on key issues, including completing the East Lake Sammamish Trail, for the next four years. The East Lake Sammamish Trail is an incomplete regional trail running 11-miles from Redmond, to Issaquah, via Sammamish. The trail is also part of the 44-mile Locks to Lake Corridor, which will connect Seattle’s Ballard Locks to the Cascade foothills. Despite the positive benefits of such a trail, building the segment through Sammamish has been an uphill struggle for King County, who owns the trail right of way and is building the trail. Progress through Sammamish has been mired by lawsuits, first between King County and lakefront property owners, and now between King County and the city of Sammamish. 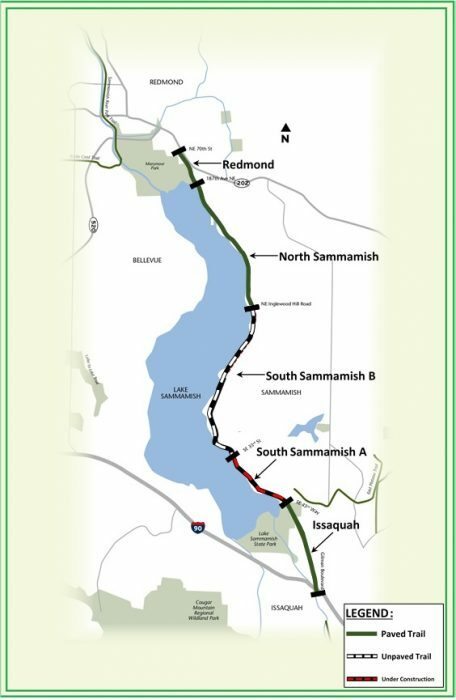 The 5 miles of the East lake Sammamish Trail through the City of Sammamish have been years in the making, whereas the Redmond and issaquah segments were smooth sailing. New leaders in Sammamish are the best hope to clearing the stalemate and moving the trail forward. Washington Bikes believes that completing the trail to regional standards, resulting in a paved trail that’s accessible to people of all ages and abilities, is essential. That’s why we’ve endorsed candidates in all four Sammamish City Council races who will come to the table ready to work towards completion of the trail as soon as possible. As we reported this summer, the stalemate between city and county is currently being mediated by the courts. The city of Sammamish is currently appealing a court-endorsed decision that two sets of stops signs on the trail face towards low-traffic roads rather than the trail. It’s yet another example of the Sammamish council fighting the inevitable and much loved trail at every turn. And this time its at the expense of trail safety: Stop signs throughout the rest of the trail face the roads that bisect it; trail users will expect the same in this location. Furthermore, limited sightlines along the trail mean that people crossing the trail slowly (e.g. older and younger generations on foot and on bikes) wouldn’t be able to foresee whether they have a safe crossing distance. The stop signs are just one example of the city digging its’ heels in at the expense – literally – of residents and completion of the trail. Our Sammamish endorsed candidates bring passion, pragmatism and new ideas to the table. 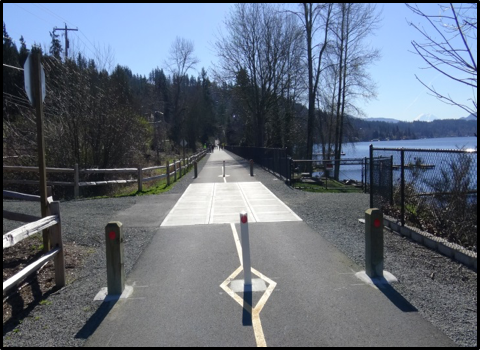 If elected, we plan to work with them to open a new chapter on the East Lake Sammamish Trail, and one day soon stand alongside them to open the final segment of the trail for all people to safely use and enjoy. It’s not just Sammamish where electing bike-friendly leaders now is essential. In each one of the Eastside communities we’ve endorsed, there are important funding and policy decisions coming up that can make for safer, connected communities by bike. This November let’s elect bike champions to pave the way for Eastside communities to take bold steps in creating safe places to walk, bike and get to transit, for all people, regardless of age and ability. Sign up today to elect these bike champions and read on about what’s at stake in east King County this election. Washington Bikes has endorsed state Senate and city council candidates in nine Eastside communities this year. That’s because from Kenmore to Renton, and everywhere in between, there’s growing demand for safe places to bike. Bike-friendly leaders are needed now to help deliver on key projects and funding already underway in some communities, and in demand in all communities. From the Burke Gilman to the East Lake Sammamish trails, there is an almost-connected trail network that knits together Kenmore to Redmond (via Bothell) and very shortly Kirkland to Renton (via Bellevue). In Redmond, Bellevue, and Kirkland, Washington Bikes has identified champions who support completing the Eastside Rail Corridor trail through those communities. In Sammamish, a pro-trail council matters now more than ever, and we’re confident the four Washington Bikes endorsed candidates will help complete the East Lake Sammamish Trail. While Eastside communities are abundant with well-loved regional trails, they often lack safe places to bike on streets – in neighborhoods, near schools, and in downtown shopping and employment centers. Electing bike-friendly leaders on King County’s Eastside this November will ensure that policies, funding, and laws which make for safe streets and better trails advance over the next several years. For example, the City of Kirkland is constructing its first neighborhood greenways next year and ongoing funding and elected representative support will be needed so that the greenway network can expand. 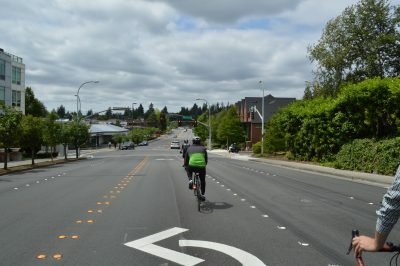 East King county has an abundant – and growing – trails network, but many communities lack safe on-street bike networks to get to work, transit, or to run errands by bike. By electing bike champions on the Eastside this November we can start building much needed urban bike networks and last-mile connections. 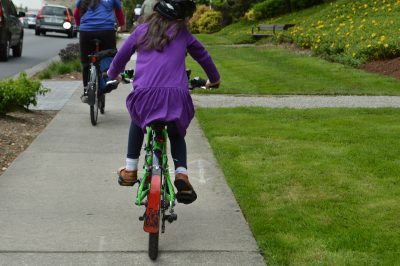 Last year, residents in Bellevue and Kenmore approved tax measures that include funding safe places to bike. We need elected representatives who’ll make sure sufficient funding from these new funding sources go to projects that will truly make Bellevue and Kenmore walkable and bikeable. In Bellevue, this means electing leaders who are willing to dedicate funding towards building a downtown Bellevue bike network by 2020. Biking and walking are healthy and affordable ways to get to transit – but only if transit hubs and station areas are accessible on foot and by bike. With Link Light Rail stations slated to be built in Mercer Island, Bellevue and Redmond, elected leaders who will champion walk- and bikeability in the coming years are essential. For example, the forthcoming Marymoor and Downtown Redmond Link Light Rail stations hold potential to both connect the Eastside Rail Corridor and East Lake Sammamish trails through Redmond, and to connect the abundant trail network in that area directly, safely and intuitively to the future light rail stations. It’s an exciting prospect but one that will require Redmond city council members who support expanding safe places for people to bike. In each one of the Eastside communities where we’ve endorsed, there are important funding and policy decisions coming up that can make for safer, connected communities by bike. There’s work to do to make streets around schools safer for children, for investments in recreational places for biking and for connected on-street bike networks. That work starts with electing bike-friendly leaders.